"Your goal as an Internet entrepreneur should be to have a presence on everyWeb-based marketplace where your customers and potential customers shop. In The Online Millionaire, I'll introduce you to the most popular online channels and reveal the tricks of the trade for excelling in these marketplaces. "You'll learn the ins and outs of selling on eBay, Amazon.com, Yahoo!, Overstock.com, and other auction marketplaces. You'll also read about how to use search engines and comparison-shopping sites to attract customers and drive sales. Plus, you'll find out how to go about building your own professional e-commerce store, along with proven ways to make money promoting other companies on your site. "While it is still the 800-pound gorilla of e-commerce, as you'll realize by the timeyou reach the final pages of this book, online entrepreneurs now have many other options to reach buyers beyond eBay. I'll show you exactly how to launch your own multi-channel online marketing empire, regardless of the types of products you sell. You'll discover how each online channel works, what it costs to sell there, how to get started, and what products sell best. "So, let's get started on this journey to creating a thriving online business that can put your company front and center on all of the world's top e-commerce sites." AMY JOYNER is an online expert and award-winning business and technology reporter. The author of numerous books, including The eBay Millionaire (Wiley), she has been covering e-commerce and entrepreneurship for many years, and also runs her own thriving eBay business. Joyner has appeared on a variety of media outlets, including CNN, the BBC, and National Public Radio. In addition, her work has been featured in such newspapers and magazines as the Washington Post and Fortune. How Multichannel Online Marketing Works. Chapter 3. Auctions and Shopping on Yahoo! Chapter 4. Building Your Own Web Site. Chapter 5. Other Auction Sites and Online Marketplaces. Pros and Cons of the Various Auction Sites. Chapter 7. Using the Comparison-Shopping Engines. Chapter 8. Advertising and Affiliate Programs. 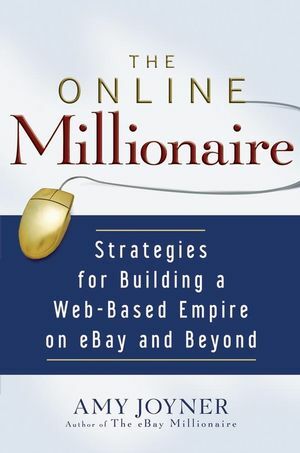 Fifty Keys to Becoming an Online Millionaire.